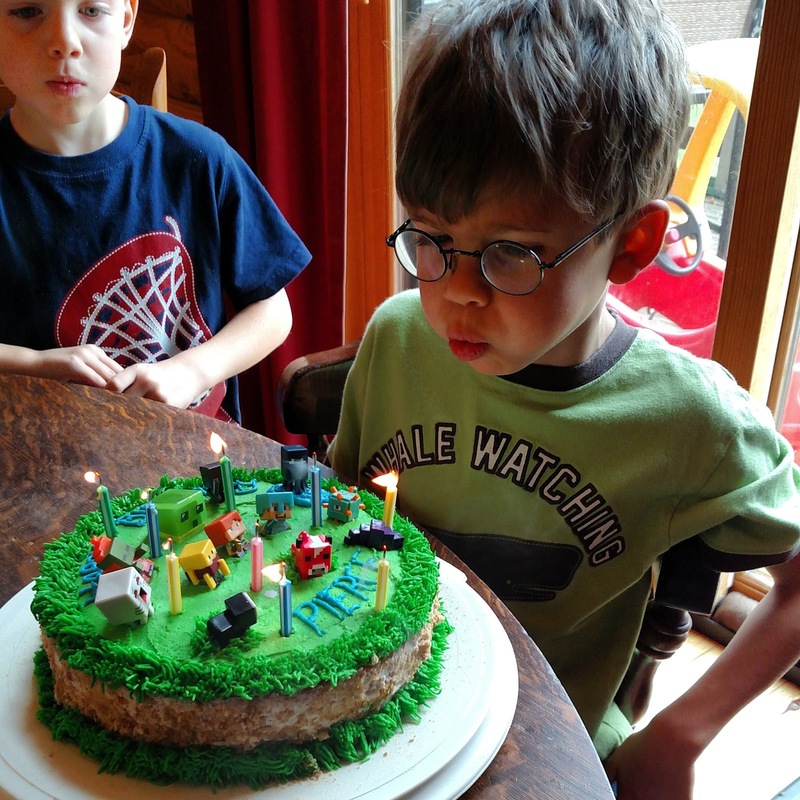 Last month, Pierce celebrated his 9th birthday. It was a fun day, even though half of the usual family members who come weren't able to make it this year for a variety of reasons. Pierce wanted a Minecraft cake. Thank goodness for those minifigure packs - they make the cake making process much easier. I did a white cake with a middle layer of peach jam, buttercream frosting, and cinnamon graham crackers around the edges. My dad declared it his favorite of my cake creations. With salted caramel pretzel ice cream, it was very tasty. Here's hoping Pierce has a great ninth year! you did an outstanding cake for Pierce, 9 years old that is a WOW number :-). I've never heard of this ice-cream combo, sounds delicious no divine, is it good good good? Looks and sounds like he has a great birthday. Best wishes. Birthdays only come once a year and are always special. Gefeliciteerd als ik jarig word wil ik ook wel z,on taart. Hey, our sons are only a couple months apart! Happy b-day to Pierce! awe that sweet boy, 9 already? so big already. happy belated birthday to your sweet oldest. Happy Birthday Pierce! Your cake looks soooo cool! The cake is so pretty. Is there any recipe? Did you buy the figures on-line?? I want to make a minecraft cake for my son too! Happy Birthday, Pierce!!! I bet he loved his cake! Wow, it sounds and looks like you have a talent for making cakes! I love to bake, but have somehow never made a cake! What a fine cake! Happy birthday to Pierce! Happy 9th birthday to your sweet Pierce! That cake looks/sounds amazing; what a great combo. Happy Birthday to him! If you guys lived close to us I'd invite you over. I bet our boys would have fun. They love Minecraft. They've only played it twice, but Mica's read lots of books on the game.